State Board/Commission/Council: Minnesota State Board of Investment; 19?? to 19?? She ran unsuccessfully as the Democratic-Farmer-Labor endorsed candidate for the United States Senate in the 1984 election. She lost to Rudy Boschwitz. She was a member of the Democratic-Farmer-Labor Party. When she was elected Minnesota Secretary of State, she became the first woman to be elected to a Minnesota statewide office without having been appointed first. Her father served as Mayor of Buffalo, Minnesota. Women Making Change (Documentary). Minnesota: Twin Cities Public Television (TPT) and American Association of University Women, Red Wing Branch, Original Broadcast Date: September 25, 2011. - "Stories of vision and courage from women in Minnesota politics over the past century, leading and inspiring others." Includes former legislators Coya Knutson, Joan Growe, Margaret Anderson Kelliher, Sandy Wollschlager, and Laura Brod (mentions Mee Moua). 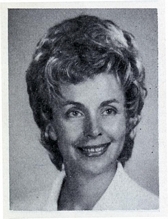 Joan Ruth Growe Profile, 1974? Donovan, Sandy. "Growe Steps from One House Term to Six Terms as Secretary of State." Session Weekly, St. Paul: Minnesota House of Representatives Information Office, March 6, 1998, p. 4. Joan Growe Papers, 1936, 1973-1998 - Available in the Minnesota Historical Society's Collections.